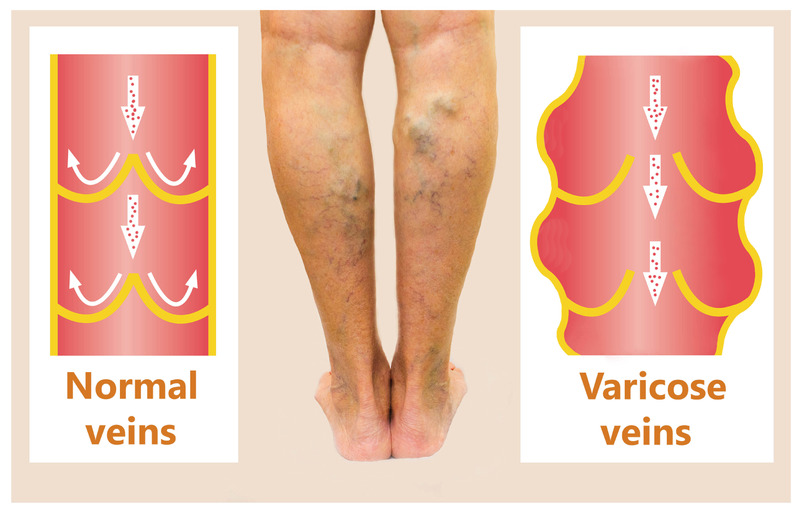 Varicose veins refer to a condition caused due to the abnormal enlargement of the veins. It occurs due to the laxity of the walls of the veins due to which they become weak and tortuous. Though this condition can affect any vein in the body, it is more common in the veins of the legs and feet. The increased pressure or weight on the legs and the flow of blood through these veins against the gravitational pull are the factors responsible for the higher risk of varicosity of these veins. Ayurveda offers effective alternative varicose veins natural treatment that is aimed at strengthening the muscles in and around these veins and preventing their laxity. Varicose veins can cause pain in the legs and discomfort. In some cases, the symptoms may be mild, but still, require medical intervention due to the cosmetic disfigurement caused due to the visibility of the dilated veins. These veins often appear as the legs of a spider. Hence, this condition is also called spider veins. The regular use of ayurvedic herbs can control the symptoms of this condition. Using herbal natural remedies for spider veins can also minimize the disfigurement by restoring the normal structure of the affected veins. Though some patients do not develop any pain due to varicose veins in the initial stages, the condition can become worse over time due to the constant pull on the damaged veins. If not treated properly, the loss of musculature in the walls of the veins can further affect the flow of blood from the legs to the heart. As a result, there is an increased backward pressure in the veins. This result is the pooling of blood in the affected veins as the muscles fail to pump the blood against the gravity. The treatment recommended by Ayurveda, the system of Indian medicine, is recommended to prevent the worsening of varicose veins and reduce the risk of complications caused due to the pooling of blood. The backward pressure in the veins of legs can also cause significant damage to the valves in these blood vessels. In normal individuals, these valves facilitate the upward flow of blood by blocking the blood from returning back through the vein. However, when varicose veins progress and cause damage to these valves, the blood flows backward thus worsening the symptoms. Spider veins natural treatment using ayurvedic herbs can reduce these symptoms significantly. If not managed properly, varicose veins can worsen and cause serious complications such as ulceration, and eczema. Painful ulcers may develop on the skin over the varicose veins in feet and near the ankles. Occasionally, the deep veins of the legs are enlarged resulting in swelling in the legs and feet. In some cases, the veins close to the skin burst causing bleeding. Ayurveda offers the best natural treatment for spider veins and prevents these complications in a safe and effective manner. The patients are often prescribed Non-Steroidal Anti-Inflammatory Drugs (NSAIDs) for varicose vein relief and to control inflammation. However, if these medications are taken for long periods, can cause side effects including abdominal discomfort, vomiting, nausea, and heartburn. Some patients need surgical intervention that involves removal of the affected veins from the legs or thighs. However, these procedures can hamper the natural blood flow through the legs. Hence, patients diagnosed with varicose veins are advised to first seek ayurvedic treatments to control inflammation and derive relief from pain without the risk of side effects. Herbal remedies can prevent abnormal dilation of the veins in the face, legs and other parts of the body and thus, reduce spider veins on face as well. Here are some of the most effective herbs for varicose veins that can provide long-lasting relief from the pain and other symptoms of this condition. These herbs also prevent further damage to the veins with their natural medicinal properties. Brahmi (Bacopa monnieri): Brahmi offers a natural cure for varicose veins with its medicinal potential to control inflammation and oxidative damage. It can strengthen the muscles in the blood vessels and facilitate a smooth blood flow through them. Guggul (Commiphora wightii): Guggul can be used to prevent eczema, ulceration, bleeding and other complications of varicose veins. It works by producing a natural anti-inflammatory effect. Ashwagandha (Withania somnifera): Using Ashwagandha can be the best way to treat varicose veins, when the condition has progressed and caused significant damage to the valves. The restorative and regenerative properties of this herb can help to support the valve health and promote a smooth blood flow through the veins. Turmeric: Turmeric offers the best cure for varicose veins in the legs and face. It can minimize the skin damage and restore the natural color of the skin over the affected veins. Punarnava (Boerhavia diffusa): Varicose veins in testicles can be managed effectively with the help of Punarnava. It works by strengthening the muscles that support the blood flow through the veins. Arjuna (Terminalia arjuna): Arjuna can be used for nose veins treatment to reduce bleeding from the nose. It can also prevent dizziness that occurs due to severe nose bleeding. Pushkarmool (Inula racemosa): This herb possesses anti-pruritic, analgesic and anti-inflammatory properties that provide relief from itching, pain and other symptoms of this disease. Patients with varicose veins can use ayurvedic natural remedies for varicose veins to obtain faster relief from the symptoms of this disease. The Ayurvedic doctors at the Melbourne natural medicine clinic, “Pure Herbal Ayurved Clinic” offer a holistic treatment that is aimed at preventing further damage to the veins. A regular use of herbs, coupled with an ayurvedic diet, can reduce the need for complicated surgical intervention. Ayurvedic herbs also include topical remedies that can reduce the appearance of spider veins on thighs and legs thus minimizing cosmetic disfigurement. Patients diagnosed with varicose veins can seek a holistic treatment at the best Ayurvedic clinic in Melbourne. The use of ayurvedic medicine with natural herbs can be highly beneficial for obtaining relief from the disturbing symptoms of this disease. The herbal treatment works by producing anti-inflammatory and antioxidant effects on the affected veins. The Ayurvedic naturopath in Melbourne will prescribe herbs that can protect the region against further damage and thus, prevent the worsening of the symptoms. A regular treatment at the Melbourne wellness centre can also help to reduce the further damage to veins musculature system. The ayurvedic doctor in Melbourne can offer advice about the diet and lifestyle changes to control the progress of this disease. The treatment is aimed at correcting the balance in the three doshas. It enhances the functions and structural integrity of the veins and the muscles in the legs that support the blood flow in this part. The holistic doctors may recommend panchakarma detoxification to support the elimination of toxins from the body and speed up the natural healing processes for faster recovery.